「송준길 행초 서증손병하(宋浚吉 行草 書贈孫炳夏)」는 조선중기의 학자ㆍ문신ㆍ명필인 동춘당 송준길이 송(宋)나라 양시(楊時)의 칠언절구 「저궁관매기강후(渚宮觀梅寄康侯)」를 장지(壯紙) 네 장을 이어 붙여 대자 행초로 쓴 것이다. 말미에 “숭정기유청화춘옹서증손병하(崇禎己酉淸和春翁書贈孫炳夏)”라 하여 1669년 사월에 64세의 할아버지가 손자 송병하(字 子華)를 위해 써주었음을 알 수 있다. 이 서축(書軸)은 동춘당 송준길(1606~1672)이 남긴 여러 필적 가운데 규모가 제일 큰 대폭으로 손자 송병하라는 수증자와 1669년이란 필사연대를 완벽하게 갖춘 예이다. 또 종택에 전해오던 필적으로 보존상태도 매우 양호하다. 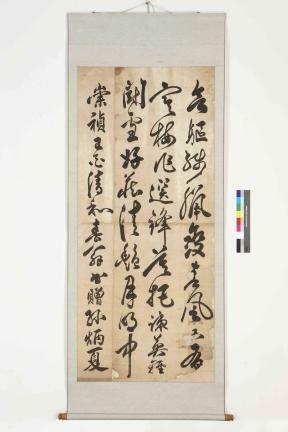 This sample of calligraphy by Song Jun-gil (pen-name: Dongchundang, 1606-72), produced in semi-cursive and cursive writing, consists of a quatrain with seven Chinese characters on each line composed by Yang Shi (the Song Dynasty of China) written on a long scroll of paper (four piece-pasted). According to a phrase at the end, Song Jun-gil produced it for his grandson, Song Byeong-ha, in April 1669, when he was 64. It is the largest of Song’s calligraphic works, and has been preserved in good condition by the head house of the Song family.